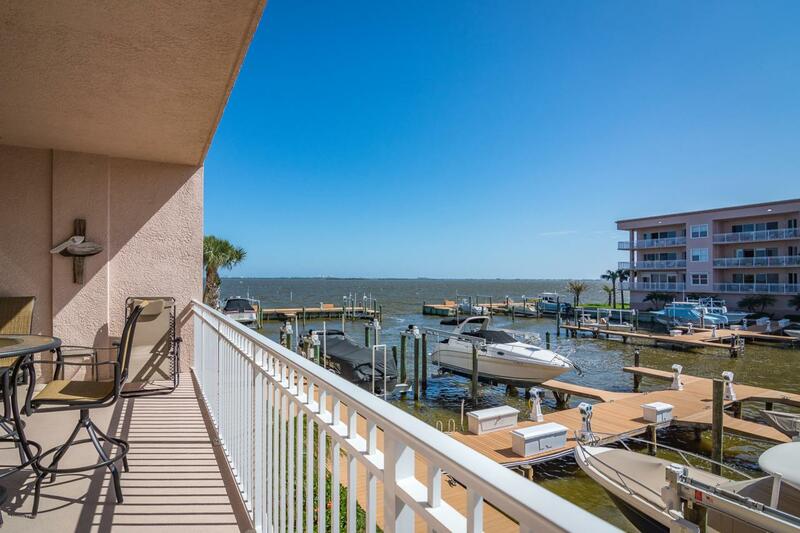 Direct waterfront community offering miles of views of the Banana River. The perfect backdrop for quality sunrises and watching the abundance of wildlife right in your backyard. Look north to experience launches from the Space Center and the cruise ships departing and arriving from The Port. This spacious, wide spaced three bedroom-three bathroom unit overlooks the river and pool/spa. Open the triple sliders of the Great Room to welcome in the fresh air. Mstr. Bdrm. slider to balcony w river views. Interior freshly painted in 2018. New ceiling fans/lights in the bedrooms. Wood floors in 2018. Private marina with boat slips available. Short distance to the beach, Kennedy Space Center, Orlando International Airport. Centrally located to many restaurants, shopping and many sites to see.